Extensive “s” shaped galleries where an Emerald Ash Borer has destroyed the inner bark of an ash tree. A panel showing the range of grain patterns and color in ash lumber. A pair of ash logs with almost all white sapwood. Ash log showing variegated heartwood probably resulting from wounding and infection. Wide ash boards with mostly all brown heartwood. Mixed ash heartwood and sapwood. Finished and unfinished variegated heartwood in ash. In 1904 Chestnut blight from Asia was brought to the eastern United States and by the 1940s it had spread throughout the entire range of the species. A very valuable timber species was lost and the lumber from reclaim operations is highly sought after today. Reclaimed ash and chestnut lumber are sometimes confused, perhaps because they have both been attacked by a deadly Asian import. The Emerald Ash Borer (EAB), also from Asia, was discovered in Southeast Michigan in 2002. Since then it has spread to 20 states. All five species of our eastern commercial lumber species of North American ash are susceptible and once EAB attacks a tree, death is certain in about two to three years. High valued ornamental trees can be treated with a pesticide and saved. It is not practical to save forest trees by use of chemical treatment. In EAB infested areas, it is recommend that all merchantable ash be harvested before the trees die. There are five different commercial lumber species of ash in eastern North America. White ash is the preferred lumber species. It has a coarse grain pattern like oak; moderate to fast growth stock is dense and strong. Very slow growth wood can be brash. The wood dries easily, machines well and bends well when steamed. It is noted for its use in flooring, furniture, athletic equipment such as baseball bats, hockey sticks, long handles for shovels and spades, boat oars and any application where high strength and the ability to bend without breaking is important. The color of ash wood can vary substantially. Consistency in mass-produced products is important. 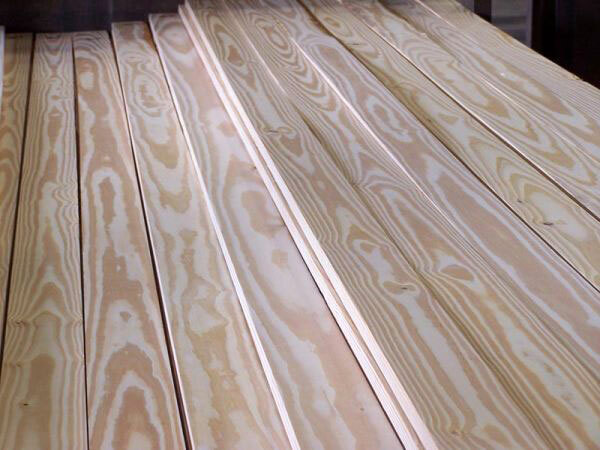 Stock wood products manufacturers usually prefer the all-white sapwood typical of younger fast-growth trees and may sometimes specify that a shipment be a certain percentage of white. Unlike hard maple, ash wood color is not specified in the National Hardwood Lumber Association's grading rules or in the industry price reports. In older and slow growth trees the heartwood can take on interesting patterns. It may be all light brown or more likely modeled or variegated. Other material can be more striped like zebra wood. The word “calico” appears on some Internet ads and shows the high contrast between white sapwood and brown heartwood. The variegated material is generally not sorted for the wholesale market place. Large quantities could be obtained by request or for quantities of a few thousand feet or less local sourcing from smaller producers would be suggested. Hoarding of ash lumber is probably not a good idea. The heartwood of chestnut is naturally resistant to decay. As a result it can still be salvaged from old structures and dead wormy chestnut was salvaged during logging operations up through the 1960s. Ash has no natural resistance to either decay or insect attack. Even kiln=dried lumber in storage can be attacked by powder post beetles. When they develop, these beetles are controlled by fumigation or heating to somewhat over 130 F.
As the insect spreads, ash will eventually be eliminated from commercial forest stands and it could very well be the chestnut of the future. As a relatively low-valued species, priced less than red oak, opportunity exists to offer a wood product that will become increasingly harder to get and more expensive. Science provides some hope for the future. The Hardwood Tree Improvement and Regeneration Center (HTIRC) at Purdue University, working with the American Chestnut Foundation, is about five years from having a blight-resistant chestnut ready for commercial sale. The HTIRC is also inserting genes into eastern ash species which may give resistance to the deadly Emerald Ash Borer. Dan Cassens is a professor of wood products manufacturing at Purdue University, West Lafayette, IN. He works with and organizes educational programs for the fine face veneer industry, hardwood sawmills and furniture manufacturers. He also owns a portable sawmill and restores historical buildings.